I've just had my boat lifted for the winter, and on first inspection I found that there is a slight movement in the rudder when gripped from the lower section. I've read a couple of early posts on this situation but can't come to a conclusion as to whether or not it's a problem? The rudder is tiller controlled and if it needs to be removed for bearing repair, any advise on how to do so would be greatly appreciated. 2005 312, Tiller, Engine 2GM20, SD20 Saildrive. Facnor SD 130 Furler. Hi Bob, in my opinion there will always be some movement. When you do not feel that the tiller has a heavy point (hope you understand this...) when steering or you don’t hear a strange ‘sound - kloink...’ I think there is no problem. Change this bearing was simple! Just lower the rudder, and replace the lower bearing. This you can see for yourself at the website from Jefa. Thank you for your reply Koppiekro. The tiller/rudder movement is smooth and there are no kloink sounds, so maybe you're correct and I have nothing to worry about. If as you say that dropping the rudder is easy, then I may just do that anyway for a visual check and maintenance. If you don't mind me asking and looking at your signature line, over what period did you own so many yachts and is "Karma your latest"? Well Bob no thanks at all. The bearings do not need any maintenance. Don't put any oil or grease in them. So I saved you time ;-) Cheers! I had a 311 with tiller steering and it had aluminium pipe/shaft and rudder bearing-housing in alu also. The bearing was made of a lot of ca. 6-10 cm length black nylon rollers. Maintenance for this kind of setup, is to flush with fresh water through the rudder shaft/pipe - If the boat it put ashore. Mine was from 2001, so question is - do you have all glassfiber/polyester pipe/shaft with all nylon bearing house and nylon bearing? I had to replace the alu pipe/shaft and alu bearinghouse for a completely new installation. The o-ring in the lower bearing house had come loose due to corrosion and built-up from dried saltwater. The result was the rudder was hard to turn to it's limits in big waves. Meaning we did not have full control in large waves. Because the o-ring had come loose - the black nylon rollers was able to twist instead of only turning/rolling and that locked the steering. I took my rudder down for inspection some years ago, and asked Jefa if it was okay that I could fit a 1,0 mm drill between the needle bearings. And that was fine with Jefa. All companies should have a excellent customer service like (danish! )Jefa - you can get a nice answer by telephone or e-mail. I take it you have a plain bearing, in which case they tend to swell slightly with water after a few years, So I would simply ingnor it for the time being. Mine is over 20 years old and is too tight. I started sailing in the late 90’s. Starting with a small 18ft and changed into a Hanse 292 within 2 years. But somehowe I kept on looking for something else. In 2017 we started to look again for a boat.. and again we feld in love with a Hanse. There are pro’s and cons but overall it is a good, fast and sturdy build ship. For this moment we feel that Karma is our dream boat so my signaturel line will not change  for now. So for the last 20 years we owned our boats for approx. 2,5 year. I also started sailing in the 90's after power boats. My first sail boat was a Moody 33 Eclipse which I learned to sail in, and kept her for three years. 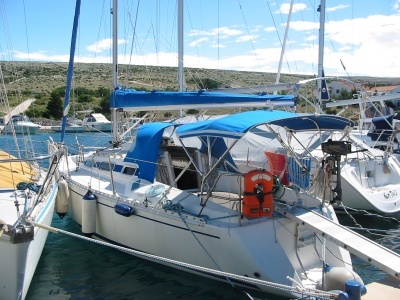 I then bought a new Beneteau 38 at the 1999 Southampton boat show and enjoyed several years sailing the Med. I had to stop sailing for a few years but then found my Hanse. As you say they are good boats especially for single handed sailors like me.